DrayTek VigorAP 903 is a wireless access point with a 5-port switch for expanding the network wirelessly. LAN clients can join the network from one of the 5 Gigabit ports or the wireless connection. It is designed to provide a smooth wireless connection by supporting 802.11ac wave2 standard and providing advanced features, such as AirTime Fairness, Band Steering, and AP-Assisted Roaming. The Plug-n-Play Mesh technology in the VigorAP 903 allows up to 8 units to be wirelessly interconnected as a Mesh group to provide extended wireless coverage. This can be achieved through the built-in Quick Start Wizard or through a Smartphone app available from DrayTek. The VigorAP 903 delivers both 2.4G & 5G Wi-Fi bands simultaneously. The 5G band can be reserved for applications that are less tolerant to interference and latency, for example, video calls. The 2.4G band can serve applications that can better tolerate latency, for example, e-mail services. 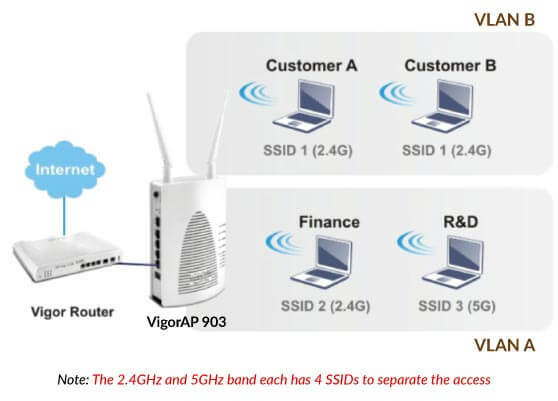 The concurrent dual band Wi-Fi feature in the VigorAP 903, supports up to 64clients on each Wi-Fi band giving a total 128 clients over both bands. It features the latest Wi-Fi technology, 802.11ac Wave 2 in the 5GHz band and 802.11n in the 2.4GHz band. The support of Multi-User MIMO (MU-MIMO) allows it to deliver high-performance wireless connection even in a crowded network. The two antennas are detachable and can be replaced with higher gain antennas for extended Wi-Fi coverage. LAN port A1 port supports 802.3af Power over Ethernet (PoE) to deliver both data and power through a single data cable. Therefore, the VigorAP 903 can be installed at a location that covers the desirable space but does not have a power outlet nearby. 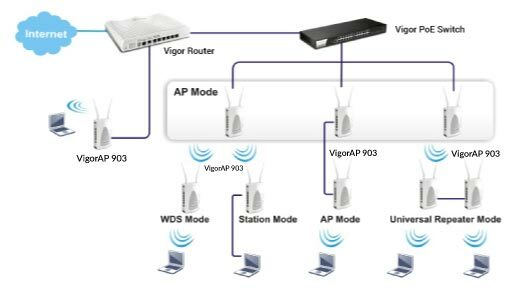 The VigorAP 903 supports a total of 8 separate SSIDs and two Virtual LANs (VLANs). These can be combined to apply different network access rules to different user groups, or to emulate several virtual access points. 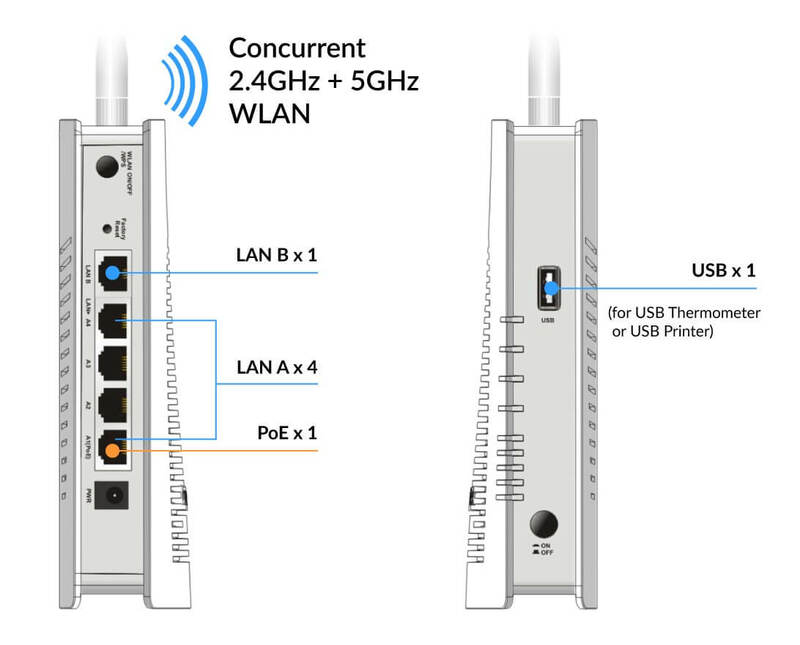 The wired connected devices can be grouped into either VLAN-A or VLAN-B, based on the connected LAN ports (Ethernet RJ45 interfaces). Devices connected to LAN ports A1-A4 can be grouped as VLAN-A and devices connected to LAN port B as VLAN-B. For example, office Wi-Fi users on VLAN-A can be given unrestricted access to network resources and guest Wi-Fi users on VLAN-B can be given restricted access to network resources. In this way, you can provide wireless accesses to visitors or the public while ensuring that the company network is isolated from the outsiders. Each of the 2.4G and 5G bands provides 4 SSID’s to separate Wi-Fi access and these can be assigned to either VLAN-A or VLAN-B. The MAC Address Filter is one security feature in the VigorAP 902 that can be used to The MAC Address Filter is one security feature in the VigorAP 903 that can be used to prevent unauthorized wireless users from accessing the Wi-Fi network. 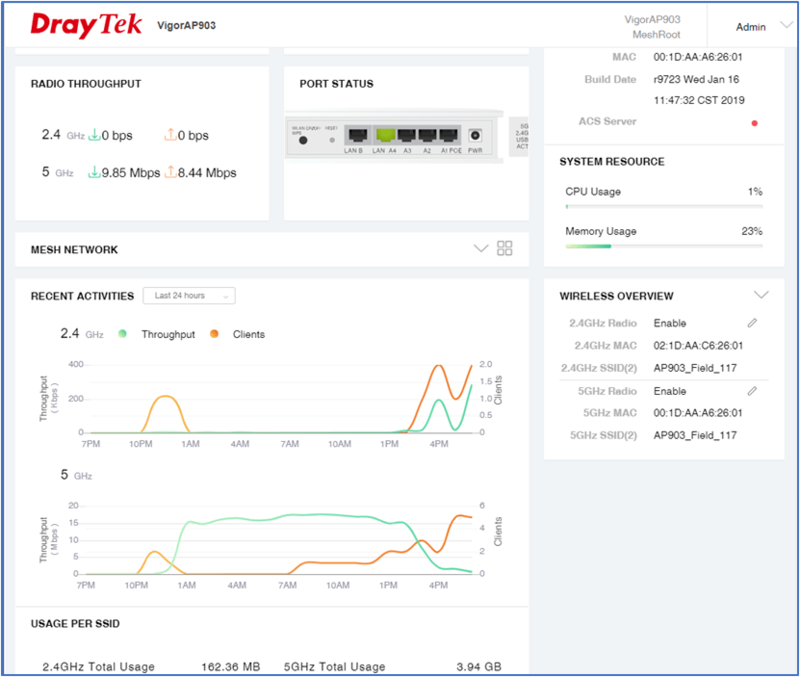 It can be configured to allow specific clients with a matching MAC address, or to block specified clients with a matching MAC address. Other business level security features include wireless user authentication, data encryption, 802.11i (WPA2) and 802.1x authentication. Furthermore, the VigoAP 903 has a built-in RADIUS server (Remote Authentication Dial-in User Service) which can handle up to 96 user profiles. It can also work with an external RADIUS server to handle user authentication. 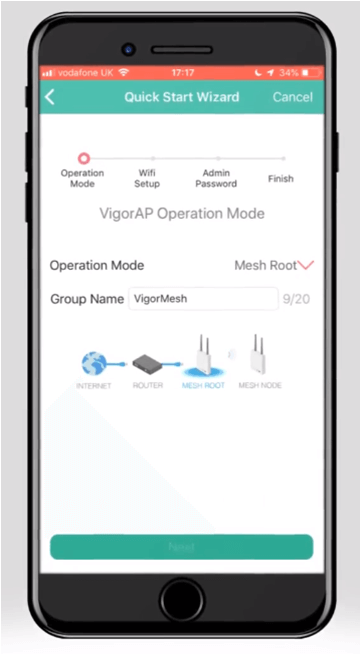 One VigorAP 903 acts as the controller (Mesh root) and provides an easy way to manage the Wi-Fi mesh through the VigorAP Mesh menu or from the Smartphone DrayTek Wireless app. 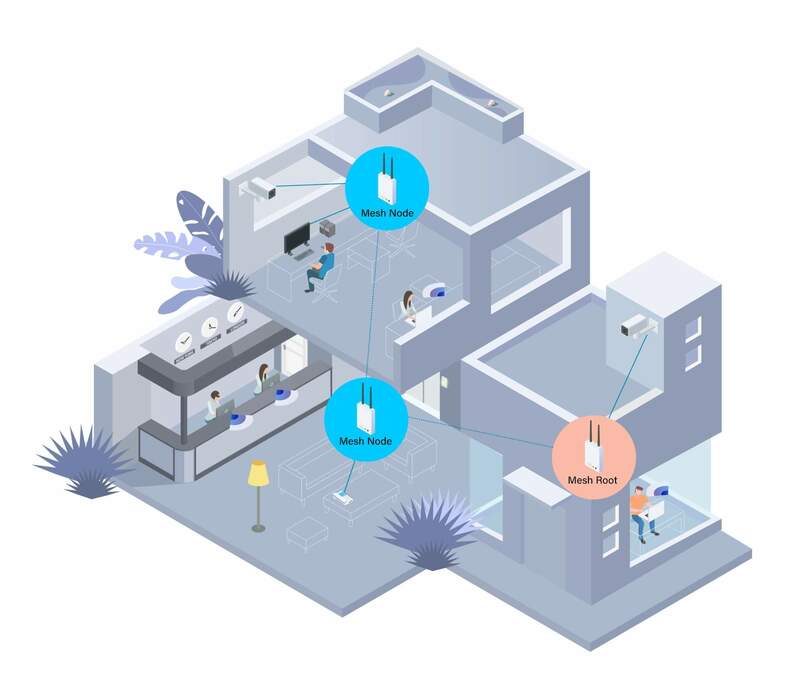 Wi-Fi mesh allows extended Wi-Fi coverage without the need to install cabling to each Access Point (Only the Mesh root requires a fixed cable connection). The meshing technology adds redundancy and reliability to your network. 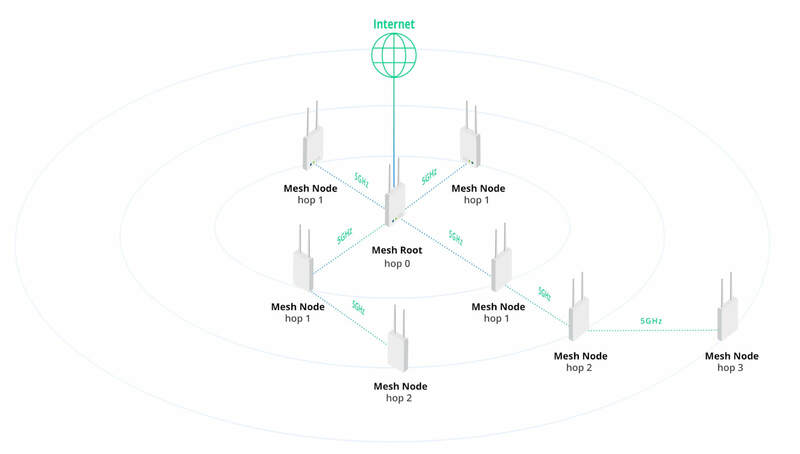 The “self-healing” feature of the mesh technology ensures that when a mesh node failure occurs, the surrounding nodes automatically re-connect ensuring continuity of Wi-Fi services. Beamforming to achieve higher speeds over long distances. The VigorAP 903 can operate in a standalone mode in places such as offices, classrooms, waiting rooms (e.g. ferry terminal, bus station, and train station), clinics’ waiting room, etc., to connect to the local LAN and/or to providing wireless access. Where a network requires several VigorAP 903 units, these can be centrally managed and monitored. 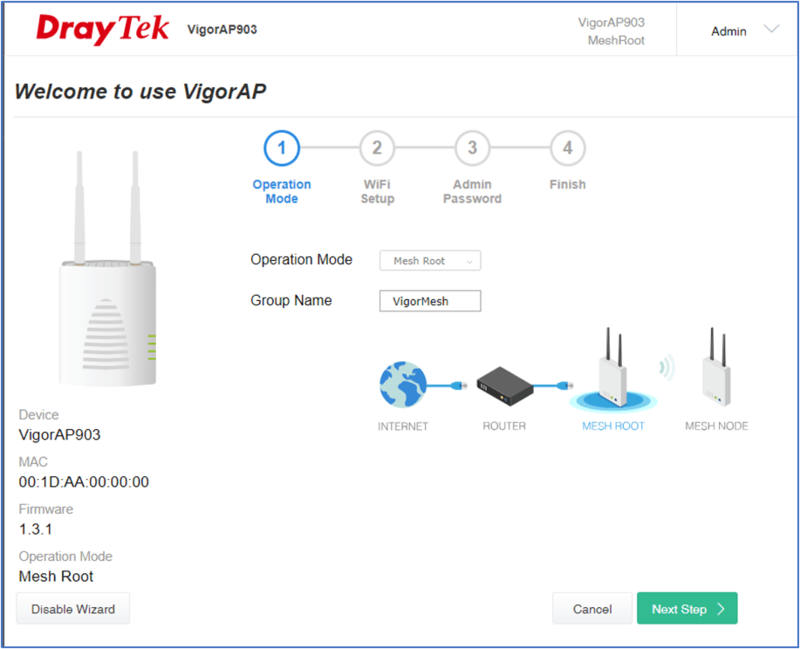 The AP Management client in the VigorAP 903 will work with the Central AP Management function that is available in most DrayTek business grade routers such as the Vigor2862 and Vigor2926 series. 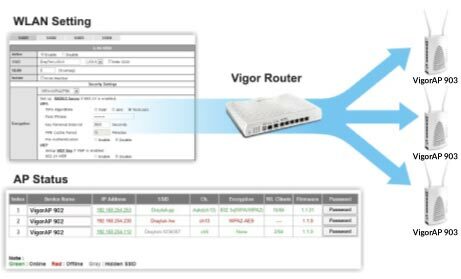 Through the Central AP Management console in Vigor routers, the network administrator can define the VigorAP 903’s SSID, encryption rule, MAC address control, upload /download limits as well as view the status of the installed VigorAP 903 Access Points. AP Load Balancing through multiple APs can be enabled through Central AP Management. You can set the percentage of traffic to go through each VigorAP 903 to prevent undesirable wireless congestion and to ensure smooth data flow. 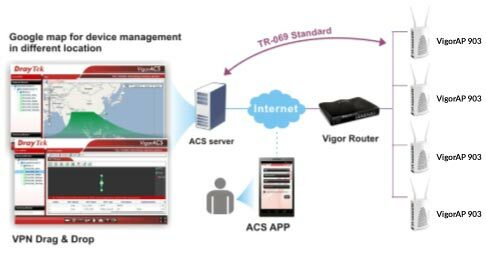 The VigorAP 903 can be managed and monitored through the VigorACS 2 central management system. The Network Administrator can perform provisioning and firmware upgrades to VigorAP 903 Access Points and get an overview of client statistics. 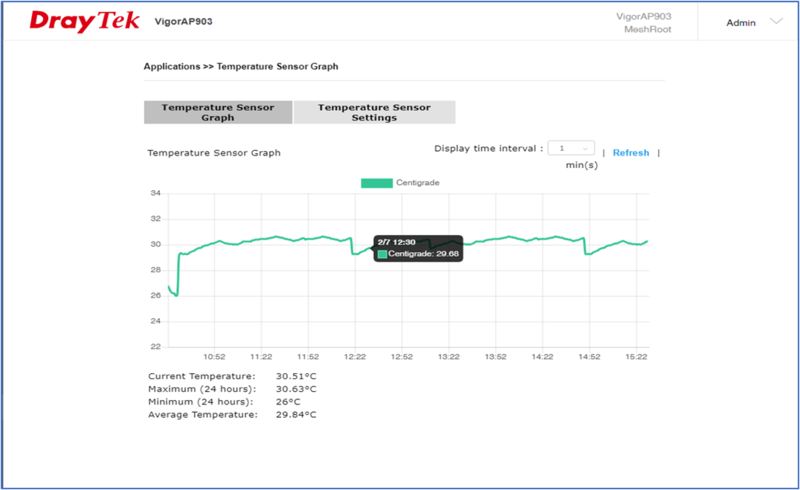 The DrayTek VigorACS 2 central management system Dashboard view shows the most important status information of the VigorAP903 on the one page. A USB thermometer can be attached to the VigorAP 903 USB port to monitor the environmental temperature where the AP is installed. The system administrator can be alerted when the environmental temperature exceeds the pre-configured thresholds.